At the 2012 ANC Policy Conference the ruling party of South Africa undertook to “increase” their support for the plight of the Palestinian people and the boycott of Israel. This position is supported by the former Director-General of Israel’s Foreign Ministry, Alon Liel and by Avrum Burg, the former Speaker of Israel’s parliament. But not all South Africans agree with this step. Member of the ANC’s International Relations Commission (and special adviser to President Jacob Zuma) Lindiwe Zulu, reported at a media briefing that: “[T]he ANC would continue to support Palestine and [has] called for an increased boycott on Israeli products”. With Swaziland, the ANC insisted that the Swazi government sign an MOU on “democratisation and unbanning of political parties”. On Palestine, the ANC took measures that will ensure sufficient pressure is brought for a just and negotiated resolution – similar to the pressure, negotiations and solution in South Africa. The complete ANC Policy Conference proposals will be released in due course by ANC’s Luthuli House. We look forward to the ANC strengthening its resolution on Palestine even further during the Mangaung conference in December. Palestinian Prime Minister, Salam Fayyad, personally thanked South Africa and also called on other countries to follow SA’s lead and boycott Israeli products. Omar Barghouti, a co-founder of the Palestinian BDS movement wrote in South Africa’s Mail&Guardian newspaper describing how other countries are closely following the ANC and South Africa. He explained how the Irish foreign minister, Eamon Gilmore, told a media briefing after a recent European Union (EU) foreign ministers’ meeting that Dublin might very soon be proposing a Europe-wide ban on Israeli products during its EU presidency in early 2013. Archbishop Desmond Tutu together with Zapiro, Zackie Achmat and several others endorsed a public petition supporting the South African government. On the other spectrum, reactionary but marginal groups, like the SA Zionist Federation (SAZF) together with the ACDP and IFP came out attacking the ANC and South African government. But this is back-firing with various South African bodies publicly challenging the right-wing groups’ “blind support for Israel”. 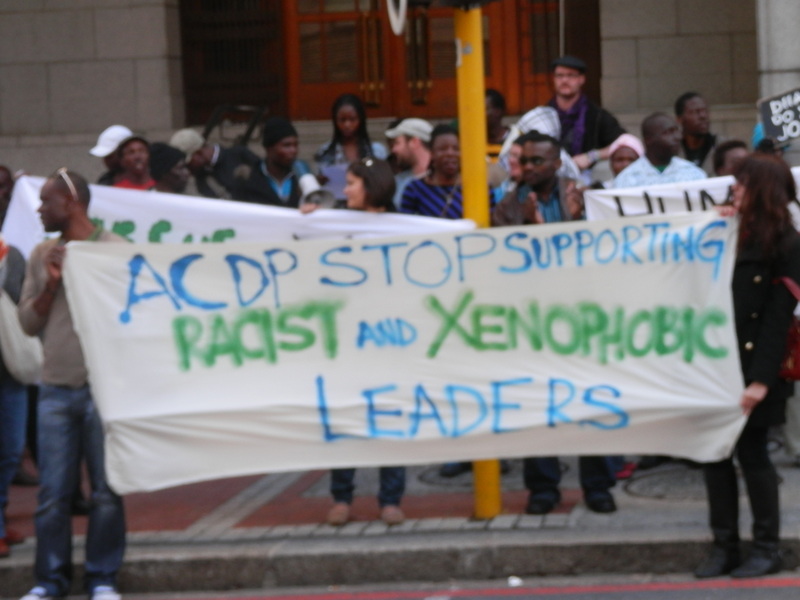 For example, South African Christians slammed the ACDP’s “misguided” support for Israel (click here); the South African Communist Party criticized the IFP’s support for Israel as “baseless” (click here); and, COSATU exposed how the SAZF is luring people by promising “free t-shirts and refreshments” to anyone that would attend their pro-Israel protest (click here). 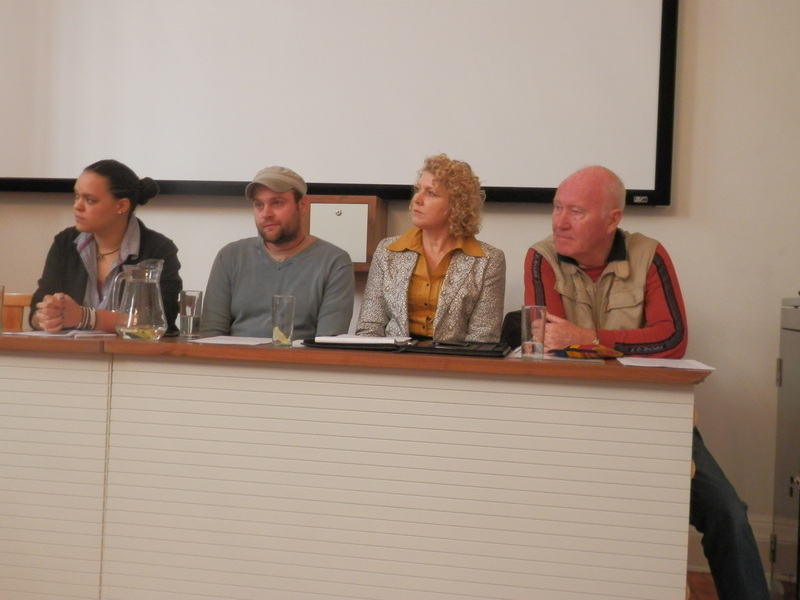 Sarah Boesak (BDS SA), Braam Hanekom (PASSOP), Marthie Momberg (Kairos SA), Terry Crawford-Browne (Palestinian Solidarity Group). 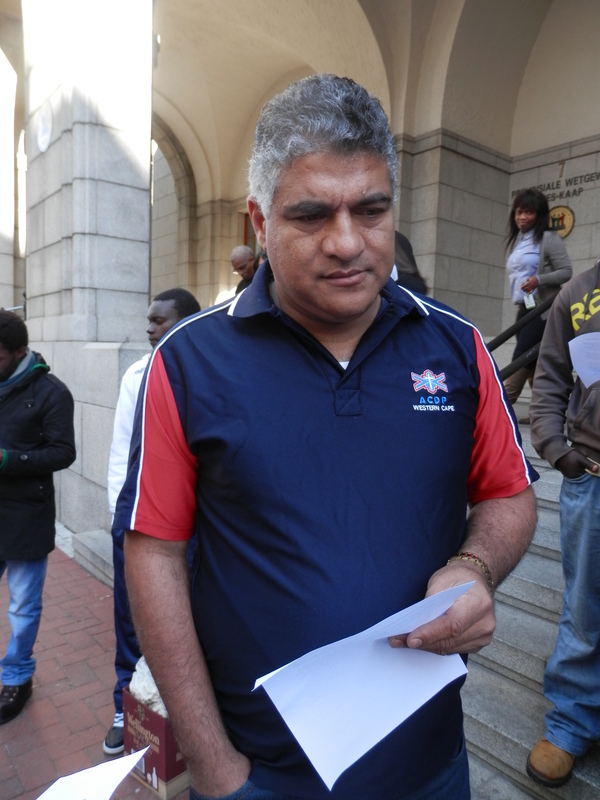 Cape Town, 28 June 2012; In front of the provincial legislative offices, handing our joint request to an ACDP representative. The ACDP representative listening to our request. The global retirement fund, TIAA-CREF, dumped 72 million dollars of Caterpillar shares from its TISCX investment portfolio. Caterpillar is notorious for its supply of military bulldozers, amongst other equipment, to the Israeli regime. Norway’s government-run pension fund, the largest pension fund in Europe, announced that it will divest all its shares from the Israeli real estate firm, Shikun Binui, that profits from Israel’s illegal activities. The Norwegian fund is worth $587 billion dollars, and this divestment decision will affect over one million dollars worth of Israeli shares. The world renown African-American author, Alice Walker, refused the Israeli company, Yediot Books, from publishing her award-winning novel, ‘The Color Purple’. We salute Alice Walker’s moral consistency, for having opposed apartheid in South Africa and now also in Israel. Support the South African government by signing the Avaaz petition here.